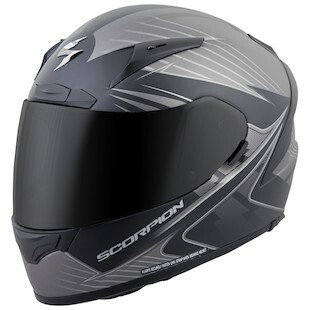 Attention racers: Scorpion has come out with new style on their premier performance race helmet, the EXO-R2000. In true Scorpion form, this graphic was named to strike fear into the hearts of your opponents. Enter the Scorpion EXO-R2000 Ravin Helmet and the Ravin Hi-Viz. No, these are not modeled after black cackling birds and no one will be writing poetry about you. Ravin: the violent seizure of prey or property; to plunder. Well, I’m not sure if you are in the mood for kidnapping or thievery, but as this helmet looks like a drill bit, plundering may be a bit easier for you (but not recommended). We already know and trust the Scorpion EXO-R2000 for an aggressive riding position and use. The emergency cheek pad removal system and aerodynamically sound shield and shell design make this helmet ideal for any track day. The surprisingly comfortable liner and AirFit cheek pad system make this helmet feel like your head never left your pillow. But what are the differences in the EXO-R2000 Ravin Helmet from the original? Other than graphic, the only difference is that every Ravin helmet will ship with a Snell 2015 rating. While it may be a crapshoot with other graphics manufactured prior to 2016, this one is sure to please your Snell-picky organization. Want to use your helmet on the street as well as the track? 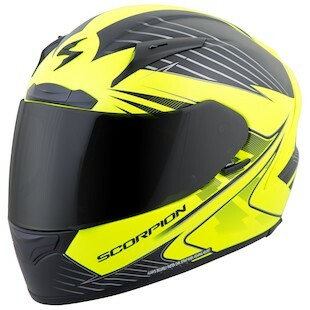 Scorpion has thought of this with their addition of the Scorpion EXO-R2000 Ravin Hi-Viz Helmet. Give yourself an edge on visibility when you are shooting down the highway - at legal speeds and never lane-splitting, of course. Looking for a race-tested helmet with new flavor? Tonto, jump on it, jump on it. Whether on the track or on the street, your head will be well taken care of in the Scorpion EXO-R2000 Ravin and Ravin Hi-Viz Helmet.